Our new moveable altar was made by Ralph Alstead, Andrea’s step Dad. It came about because as Andrea and I were showing Ralph and Andrea’s Mum Margaret around the church I mentioned that I’d like to replace our present folding table that we cover with gold fabric, with a more substantial piece of furniture. Yet it needed to be something that could still be moved, just out of the way when necessary, or into the new side chapel/prayer room (old Choir Vestry) for occasional use in there. To buy such a piece from Hayes and Finch for example would have cost in excess of £1,000. Ralph offered to rise to the challenge at minimal cost so I sent him pictures of a few examples in the Hayes and Finch catalogue along with my own specific dimensions to suit our restricted space. Within a couple of weeks Ralph called to say that the new table was ready for collection. I drove over to Bradford, West Yorkshire where they live with great anticipation very much looking forward to seeing it. I was not disappointed. The table consists of 4 easily separated sections which lock together with special fixings. The solid top has a rebated return, and the broad panels each feature a solid oak Cross detail. The table is open from front to back but for a low brace giving support to the sides. It is ideal and looks great, the colour of the finish being very close to that of our oak stalls between which it stands at present. Immediately recognising the high standard of workmanship and quality of the table I must admit that when I first saw it I was worried about the cost not having agreed a budget with Vestry. I nearly fell over when Ralph asked only for a small contribution of £30 toward the cost of materials! The new altar was in place in time to be used to celebrate communion by Bishop David on Sunday 4th August during the Confirmation Service. Although married to Andrea’s Mum Margaret whose hobby is building small scale ornamental churches (See St Nicholas’ in our living room – a fantastic ordination gift! 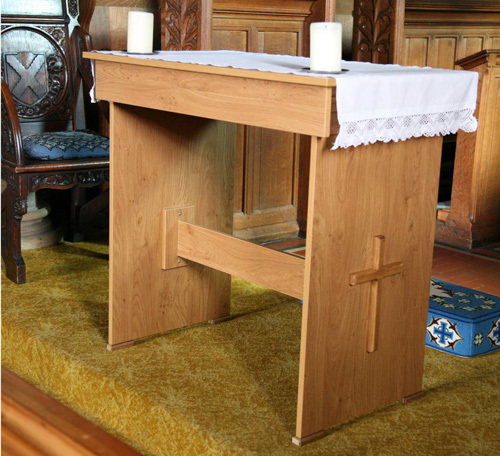 ), and himself a retired skilled joiner who has competently built houses and kitchens and many other things, this was Ralph’s very first venture into making church furniture. A fantastic job he has made of it too! We are extremely grateful for this and their kind generosity.